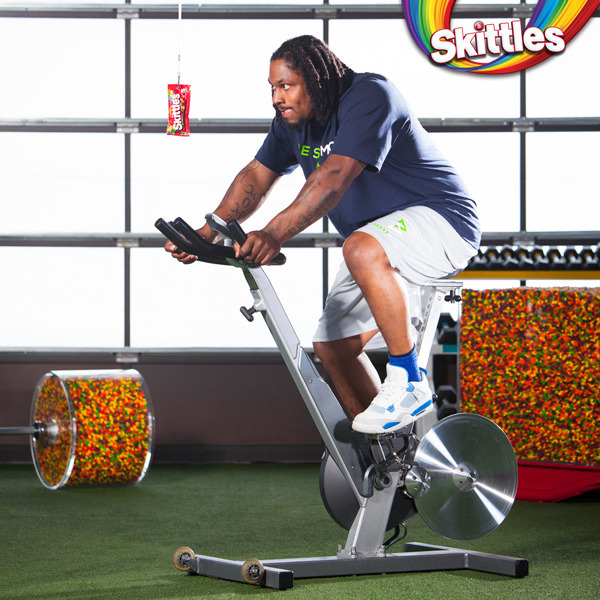 How many Skittles are in Marshawn Lynch’s barbell plates? How much do the Skittles weigh? All of the images above were created for a football-themed promotional series (Fall 2014) posted on the official Skittles tumblr website. The too low and too high guesses will help students build a framework for their “true” estimate. Students who might otherwise decline to participate in estimating—because they “have no idea”—will often join in when asked for these boundary guesses at the outset. Another advantage to having students make guesses (and actually write them down) at the start of a problem is that it increases their interest in the problem, anywhere from marginally to dramatically. This is no longer just a math problem. It’s an opportunity to be more or less right than a classmate, to get closer than the try before, to reason at the end about our “offness” (or lack thereof), etc. On the one hand, I’m feeling pretty amazing about the “offness” of our answer (less than 1%). However, I’m not sure if “more than 100,000” refers only to the Skittles in the barbell setup, or to all of the Skittles in the photo shoot. How did your answer compare to the one given (indirectly) by Mars Inc.? Whose answer do you think is more reliable? Why? Describe one or two ways you could go about reducing your error. Whatever the case, there are a number of rich discussions that might follow this task depending on what your students focused on, struggled with, etc. How much would it cost to purchase that many Skittles? How many Skittles are in a “rainbow”? How many Skittles are in this container? Have students design barbells they think they could lift.